Martin Van Buren was the 8th President of the United States who served in office from March 4, 1837 to March 4, 1841. What was the life of Martin Van Buren like? The short biography of President Martin Van Buren covers important information and facts about his early life, his family, career and the famous events and achievements of his political life. Our short biography of Martin Van Buren provides an interesting and easy way to learn about the life of the President. The following important facts provide a fast overview of important facts about President Martin Van Buren. Facts and Info: Martin Van Buren was the 8th president of America whose presidency was dogged by an economic depression that led to bank failures and food riots known as the "Panic of 1837." For additional info refer to 20 Facts about Martin Van Buren. 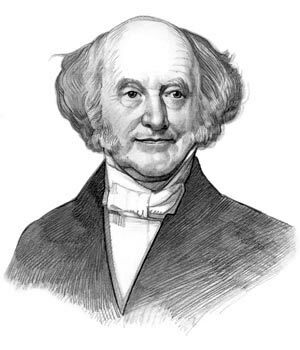 Facts and Info: Martin Van Buren was born on December 5, 1782 in Kinderhook, New York. He is the only president of Dutch ancestry and Martin Van Buren and his wife spoke Dutch at home. Van Buren was a third cousin twice removed to Theodore Roosevelt. He died on July 24, 1862 in New York. Facts and Info: The career of Martin Van Buren included the roles of Lawyer, Politician and Statesman. He became the 8th president of America in 1837 and served for 4 years until 1841. Van Buren made three unsuccessful bids for re-election. Facts and Info: Martin Van Buren married Hannah Hoes who was his childhood sweetheart and distant relative. All of their ancestors came from the small Dutch community of Kinderhook. He became known by the nickname "Old Kinderhook." People said "Is it OK?" referring to the initials of his nickname and the word okay was derived. Martin Van Buren and his wife Hannah had 4 children. Their names were Abraham, John, Martin and Smith. Facts and Info: Martin Van Buren belonged to the Democrat Political Party of which he was one of the founders. He was 54 years old when he was inaugurated as the 8th president. Richard Johnson stood as the Vice president. For additional facts refer to his Presidential Cabinet members. Short Biography of Martin Van Buren: What he was like! Facts and Info: Martin Van Buren was a slim man standing at 5 feet 6 inches and was unkindly described as "a little squirt". His favourite foods were oysters, doughnuts, raisins, figs, and meat. He had large mutton-chop sideburns which were fashionable during this era. The family owned two tiger cubs as pets. He was the first president born an American citizen as his predecessors were born as British subjects, before the Declaration of Independence. Facts and Info: Martin Van Buren died of asthmatic suffocation on July 24, 1862 in New York. He had become weak and largely bed bound and on July 21 he became comatose and died three days later at the age of 79. He was buried in Kinderhook Cemetery, New York. The short biography of Martin Van Buren provides a fast overview of the key facts and events about his life and the accomplishments of his presidential term in office. The following Martin Van Buren video enables you to sit back and listen to the history of his personal and political life - a useful educational resource for kids, children and schools learning about the life of President Martin Van Buren.